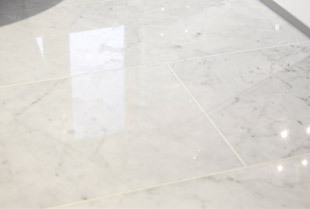 How to clean marble tiles using simple cleaning products? 1. 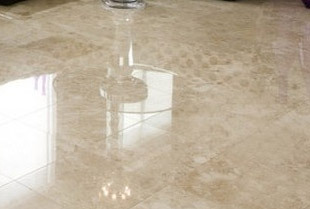 Cleaning the Marble Tiles: Make a solution of water and mild detergent. Dip a soft sponge into the solution and squeeze out excess solution. Now gently wipe the entire marble surface with the sponge to remove dirt, stains and oil marks. Let it dry for some time before moving on to the next step. 2. Buffing the Surface: A marble-specific refinish compound or buffing compound is required for this step. Apply a suitable amount of the compound on the buffing pad and with the help of an angle grinder, buff the entire surface of the marble tile. To bring the desired lubrication for the rubbing pad, make use of plenty of water. Proceed by covering small areas at a time and go as per the instructions given on the buffing compound container. This will also help you to know the exact amount of compound required for buffing. Place the grinder for a minimum of 30 minutes on every tile to completely remove scratches and stains off the marble surface. Use as much as required and keep polishing the marble tile with the grinder constantly in circular motions. 3. 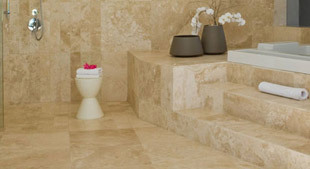 Cleaning the Buffed Area: Pour some generous amount of water on the buffed marble surface to wash off excess compound. Thereafter, wipe the whole area with a dry terry cloth towel. 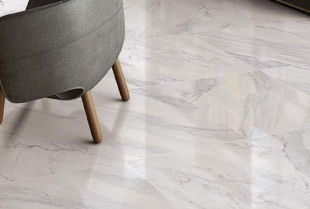 Since grinding or buffing process causes a lot of compound and water to spatter all across the marble installation area, it is suggested to thoroughly check the fixtures and surrounding area. Excess compound should be removed from such spaces using a wet towel. Let everything dry before heading to the final step. 4. Applying the Sealer: Once the refinishing is done, seal the marble by using a soft paint brush. This will make the marble surface less porous and provide resistance to minor stains and scratches. In case you are opting for a chemical compound, make sure that you are buying a genuine product, which is exclusive meant for sealing marble. Reading the instructional manual of the sealing compound is also important to avoid any unexpected damage to marble tiles. Though single coat is more than enough, it is still recommended to apply two coats. Apply the second coat only when the first coat dries out completely. 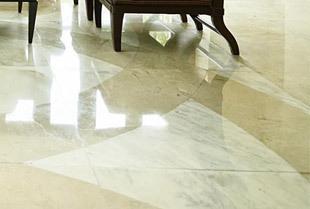 If the sealing has to be done on marble tiles in an enclosed area, it is suggested to all open windows and doors surrounding the area for effective ventilation. This prevents inhalation of harmful fumes or vapors from the sealing compound that otherwise might cause allergies and other health hazards. As mentioned above, it is always necessary to wear mask, gloves, and protective eyewear and clothing while dealing with any chemical compound. By following the above easy-to-perform steps, you can bring back the new look of your marble tiles. This further confirms long life of marble floors and keeps marble installation spaces appear more appealing. Indian marble is globally admired for its bewitching beauty with respect to shades and wavy surface patterns. The 17-year-old Regatta Universal Exports, a reputed name in the international marble export sector, offers quality marble products at highly competitive prices. Being a leading marble exporter from India, Regatta Universal Exports ensures customers of high product quality, safe packaging and transportation, and timely deliveries.